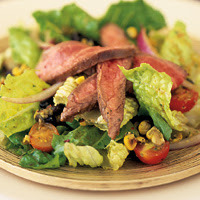 Flank steak salad with corn vinaigrette Need a healthy dinner option that will satisfy even the biggest meat lover? This grilled flank steak salad is your answer. The crisp, flavorful greens are the perfect accompaniment to the juicy, thin-cut pieces of beef. Plus, for only 300 calories, you'll get 10 grams of fiber, 20 grams of protein and a perfectly balanced meal — so savor every bite! Place a dry, large cast iron or heavy nonstick frying pan over medium-high heat. Add the corn and cook, stirring often, until the corn begins to brown, 4 to 5 minutes. Remove from the heat and set aside. In a food processor, combine the stock, lime juice, bell pepper and 1 cup of the roasted corn. Pulse to puree. Add the olive oil, 1/2 teaspoon of the salt, 1/4 teaspoon of the black pepper and the cilantro. Pulse to blend. Set the vinaigrette aside. Prepare a hot fire in a charcoal grill or preheat a gas grill or broiler (grill). Away from the heat source, lightly coat the grill rack or broiler pan with cooking spray. Position the cooking rack 4 to 6 inches from the heat source. In a small bowl, mix together the cumin, oregano, red pepper flakes and the remaining 1/2 teaspoon salt and 1/4 teaspoon black pepper. Rub on both sides of the steak. Place the steak on the grill rack or broiler pan and grill or broil, turning once, until browned, 4 to 5 minutes on each side. Cut into the center to check for doneness (medium doneness is 160 F if using a meat thermometer). Let stand for 5 minutes. Cut across the grain into thin slices. Cut the slices into pieces 2 inches long.